Best known for golden beaches in sheltered bays, restaurants on the edge of the Aegean Sea and some of the world’s most famous archaeological sites, Halkidiki is a jewel of northern Greece with something for all ages. Here are the best things to do in Halkidiki. Halkidiki is a region in the north of Greece known for its peninsulas, sheltered bays and Blue Flag beaches. Set back from the coastal areas are lush pine forests and famous archaeological sites. Offering the best of both worlds in Greece – from the glinting Aegean coastline to the country’s immense historical sites – Halkidiki is a corner of the world definitely worth exploring. The region of Halkidiki is characterised by three peninsulas that extend into the sea, which are often referred to as Halkidiki’s ‘fingers’ or ‘claws’. These peninsulas are home to glorious beaches – many of which are Blue Flag rated – and plentiful secluded bays. Ideal for swimming in calm waters or simply enjoying the sparkling sea views, this is one reason why Halkidiki exudes so much appeal to holidaymakers. A relatively undeveloped Halkidiki peninsula, Sithonia is the one to visit for unspoiled and lesser known beaches in the region. Gerakini beach is one of the more popular beaches here, with its long stretch of sand found in between hills topped with pine forests. There are a number of tavernas, bars and eateries along the beach – plus a few shops – for those who like to have a choice of facilities nearby. Psakoudia beach is a smaller sandy beach on the peninsula, but it still has an abundance of restaurants and sun loungers, plus a few water sports on offer as well as beach volleyball for those who like to keep a little active. Those who enjoy walking should visit Ormylia – a traditional village overlooking the beach full of typically Greek winding streets. 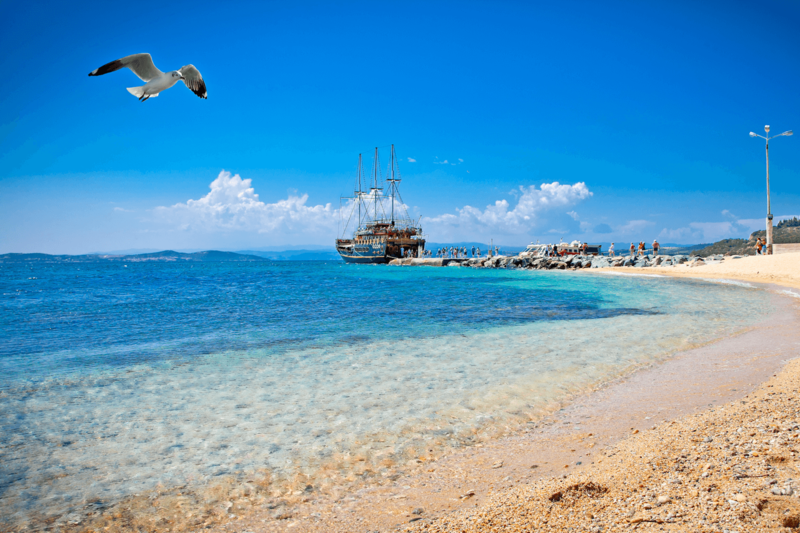 Nearby is Metamorfosi beach – a smaller beach, but widely considered as being one of the prettiest beaches in Halkidiki. The beach is directly backed by pine forest, while the small village has a number of traditional tavernas. Nikiti beach is another sandy beach next to a traditional village with a pretty harbour, so there is plenty going on here aside from beach life. For those who like more of an off-the-beaten-track feeling, a number of small sandy coves can be discovered a little further south. Sithonia peninsula is also home to a number of well-known Blue Flag beaches. This includes the small beaches either end of the perfect horseshoe cove at Neos Marmaras, popular with families for the shallow and calm waters. The resort beaches and sandy coves of Porto Karras are also Blue Flag beaches, with white sands and plentiful water sports on offer. Toroni beach is a 2km Blue Flag beach backed by forest and has a quieter appeal. Armenistis, Platanitsi and Sikia beaches on the east coast of Sithonia peninsula are also well-visited Blue Flag beaches, but the most popular along this coastline is the 2km long Sarti beach, which also has a thrumming beachside promenade and views over Mount Athos. Vourvourou is a rugged stretch of the Sithonia coastline well worth a visit too, for its white sandy beach, clear waters and cluster of islands just off the coastline. There are also coastal paths ideal for short or long walks and a handful of tavernas perfect for a pitstop. The least developed of Halkidiki’s peninsulas thanks to the ‘holy mountain’ of Mount Athos, most of the accessible beaches on Aristotelis peninsula are in the region closer to the mainland. This peninsula is home to one of Halkidiki’s most loved beaches – Ouranoupolis. People visit as much for the Blue Flag beach as for the promenade that runs behind it, which is full of cafés, tavernas and restaurants. The area is found right at the edge of the holy mountain area, meaning there are also delightful views of the rolling hills and Mount Athos itself. It’s also possible to take boat trips around Mount Athos. Other Blue Flag beaches worth visiting on the peninsula include Nea Roda beach, with its white sand and opportunities for windsurfing and water skiing, and Ierissos beach, with its long stretch of golden sand, abundance of sun loungers and promenade filled with seafood restaurants. Stratoni beach is a long and quiet Blue Flag beach with some fascinating local history – it is believed Alexander the Great used precious metals from the locality’s former mines to fund his campaigns. The best secluded beaches on Aristotelis peninsula can be found at Ammouliani – which means ‘fine sand’ – and is only accessible by a 10-minute boat journey from the port of Tripiti. As well as a number of sandy beaches and secluded coves, Ammouliani also has several traditional tavernas ideal for lunch. 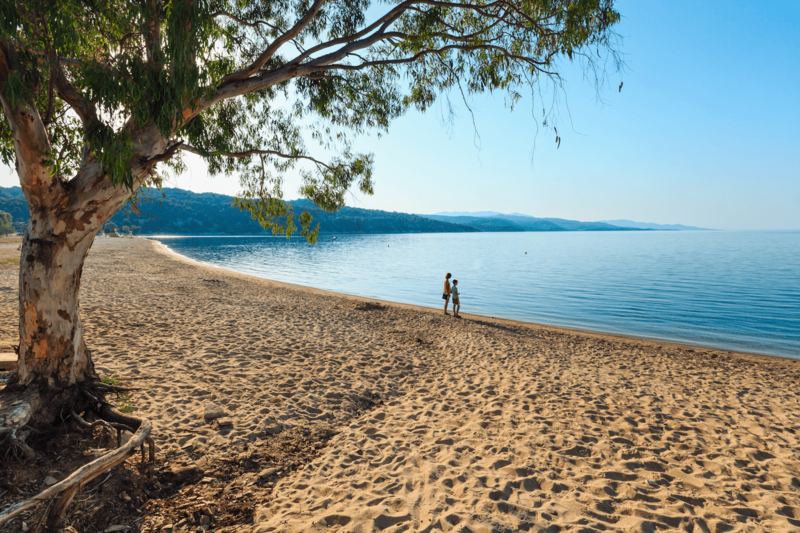 The busiest and most popular of Halkidiki’s peninsulas, Kassandra peninsula has beach options to suit all tastes. 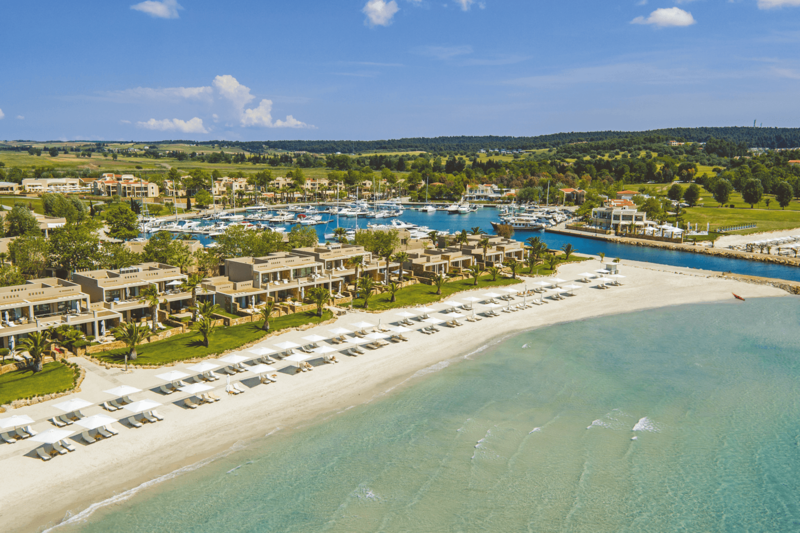 Sani Resort is one of the most popular resorts in the whole of Halkidiki for both families and couples, thanks to its luxury 5* resort hotels and all-inclusive facilities. Sani beach does not disappoint either, with soft golden sand, a wide variety of water sports and plenty of beach spots which offer a little more seclusion. There is also a pristine marina with a number of high-end restaurants, ideal for a lunchtime or evening stroll. There is an abundance of Blue Flag beaches in Kassandra, with Vargia beach in Nea Kallikratia being one of the most popular, with golden sands and many restaurants and shops nearby. The beach at Nea Potidea is also a popular Blue Flag option, with a pretty harbour to wander around too. Polychrono is a favourite spot to visit both for the Blue Flag beach and promenade, plus the pretty village with traditional whitewashed houses nearby. The beach at Skala Fourka is narrow with perfect soft white sand and shallow waters ideal for paddling. There is also a wide choice of water sports available here. 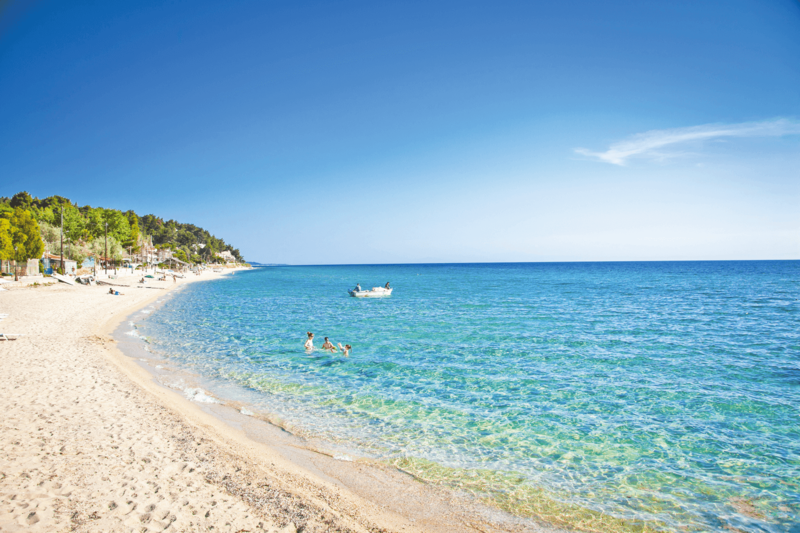 Kallithea beach – which aptly means ‘nice view’ – is one of the prettiest beaches on this peninsula. A large stretch of white sand is backed by pine trees, while plentiful water sports are on offer here. There is also no shortage of tavernas, cafés and restaurants to take advantage of. The beaches at Nea Plagia are popular with families thanks to the soft sands, shallow waters and numerous parks found just off the beach. Dionisou beach is very long and sandy – ideal for those who like to walk along the coastline or find a quiet area of beach to call their own for the day. The quiet beach at Nea Fokea is popular with those who like to mix beach time with a little exploration, with a Byzantine tower, ruins and highly-regarded seafood restaurants all within a short walking distance. With so many places to visit in Halkidiki it can be difficult to find time to see them all. Below is a selection of the very best excursions available, with our Concierge department on hand to take care of all the arrangements. Halkidiki’s holy mountain – a UNESCO World Heritage Site – is the oldest surviving monastic region in the whole world, filled with monasteries, hermitages and retreats. The historical and ongoing religious importance of this region means it’s only possible to visit via prior arrangement with one of the monasteries, which can take six months or more to arrange. Instead, most visitors to Halkidiki take boat trips to view Mount Athos from the sea. Boat trips depart from across Halkidiki, but it is most convenient to take a trip from Ouranoupolis. Athos Sea Cruises operates two trips per day from Ouranoupolis around Mount Athos, departing at 10:30 or 14:00 between April and October. Tickets cost €20, with discounts available when booking online in advance. The capital city of Halkidiki dates back to Byzantine times, making it the ideal place to visit for the bustle of city life against a historical backdrop. This is the place to go for the Archaeological Museum, a number of impressive churches and views of the surrounding hills, with the best viewing point at Tsoukalas. Also soak up the abundance of wonderful restaurants and tavernas here. This park which sits at an incredible 500 metre altitude is a must-visit in the Halkidiki region. Dedicated to the Greek philosopher, Aristotle, the park also showcases a number of the special instruments the great man used in his work on nature and physics. Enjoy a short stroll around the park while soaking up the views of the Gulf of Ierissos beyond, or follow the longer 14km Aristotelian Route. Aristotle Park opens daily from 9:30 to 20:00. Admission costs €2.50. Dating back to the Neolithic period, this is a superior place to visit in Halkidiki for history fans. Take in the ruins of the Byzantine church at St Nicholas, stop off at the Tower of Mariana which dates back to the 14th century, and stroll around the ancient city of Mikyverna. 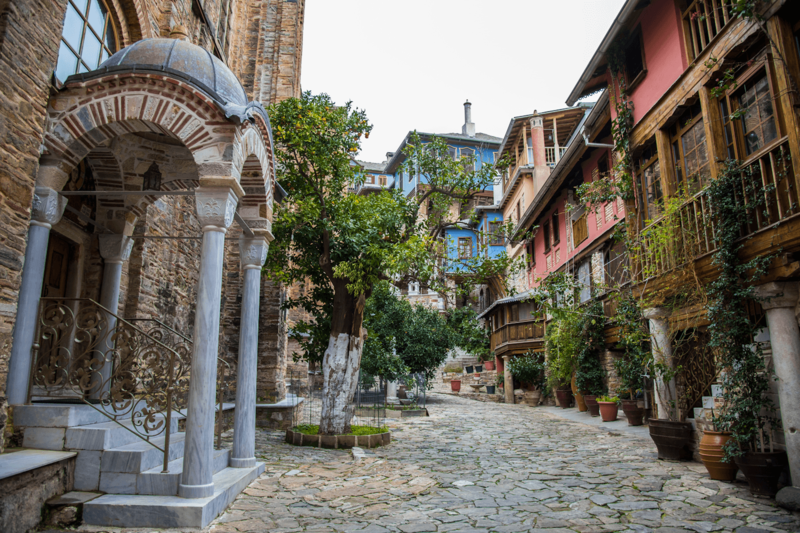 One of the oldest villages in the whole of Halkidiki, visit Sykia to take in the traditional architecture of the houses, particularly in the old quarter. This is where many of the houses have remained largely untouched since the 19th century. Also take in the castle ruins on Koukos Hill and the beach, which is a locals’ favourite. Greece’s second largest city is within an hour’s drive of Halkidiki and is perfect for a day trip to a cosmopolitan city with a long and fascinating history. 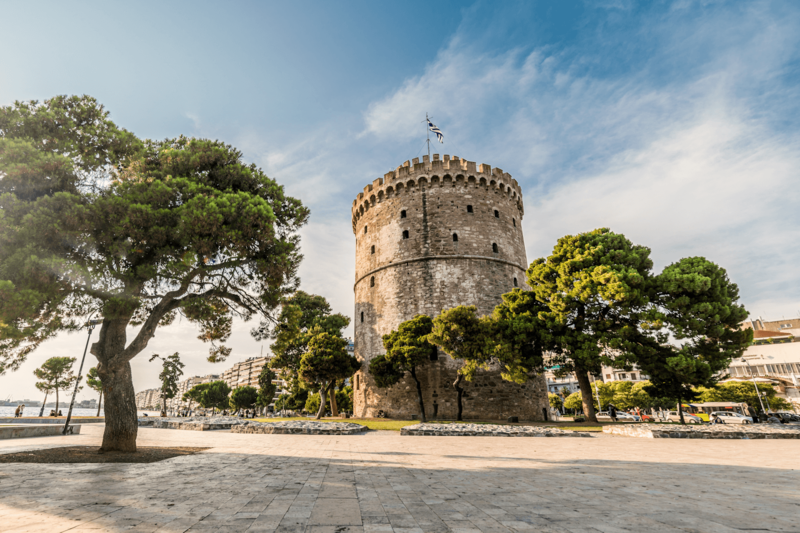 The coastal city is home to Roman monuments, Byzantine walls and the iconic White Tower of Thessaloniki, originally constructed by the Ottomans. Thessaloniki is also home to a vibrant restaurant scene, cocktail bars and low-key tavernas – ideal for making the most of Greece’s culinary credentials while watching the world go by. Reach Thessaloniki from Halkidiki by hiring a car, catching a bus or booking return transfers. This mountain near Thessaloniki was known as ‘Ypsison’ by the ancient Greeks. For those interested in the history, nature and culture of Greece, this is a great way to soak all this up while getting a little off-the-beaten-track. The best way to visit is by hiring a car, so you can stop at the traditional fishing villages along the way too. Arnaia is a village at the foot of the mountain widely said to be one of the prettiest in the region. Stop here for a casual stroll and a visit to the Historical and Folklore Museum. This town full of archaeological remains from various eras is an ideal place to visit on a day trip from Halkidiki. Famous for being the final resting place of Alexander the Great’s father, Phillip II, it’s even possible to visit his tomb. Edessa is also known for its beautiful waterfalls – more intrepid visitors can even walk behind them. A number of local Halkidiki tour operators run day trips to Edessa. Or travel by train – prices start from €10 per ticket. With its vast array of clean, sheltered beaches home to soft sand and water sports, plus villages and towns filled with child-friendly restaurants, families are well looked-after in Halkidiki. 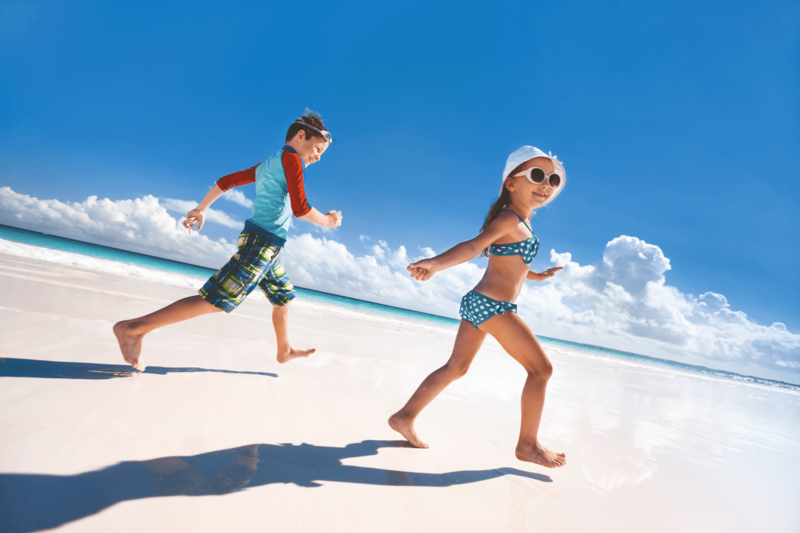 These 5* resorts on the Kassandra peninsula truly offer something for all age groups, meaning families are well catered for here. Family-friendly facilities include a variety of children’s clubs, tennis and football academies, plus an outdoor cinema showing films aimed at young people. Discovered by accident by a local shepherd in 1959, this cave at the foot of Mount Katsika is thought to have been visited by humans for at least 700,000 years. Visitors can explore the cave as well as visit the on-site museum, which displays many of the items discovered in the cave. It’s perfect for all age groups, but especially inspires a sense of adventure for children. A number of local Halkidiki tour operators run half-day trips to Petralona cave, or hire a car to make your own way there. The journey takes around one hour to drive, with entrance to the cave costing €7. On day trips to Thessaloniki, take the children to the NEOSIS museum. Covering science, the latest technologies and ancient Greece as well as a planetarium, there is enough going on for hours of entertainment for the whole family. NOESIS is open Tuesday to Sunday from 10:30 to 15:00, Saturdays 13:00 to 21:00 and Sundays 11:00 to 19:00. Entry costs €12 per ticket, with family tickets available too. 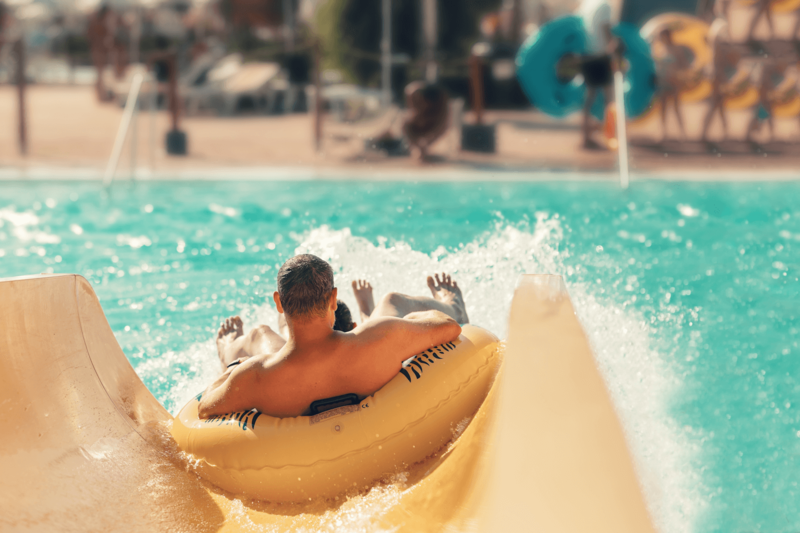 This water park has slides, rides and activities suitable for young children and teenagers, with some quiet areas for a little chill-out time too. Waterland is open throughout the summer, with tickets starting from €11 for children and €14 for adults. 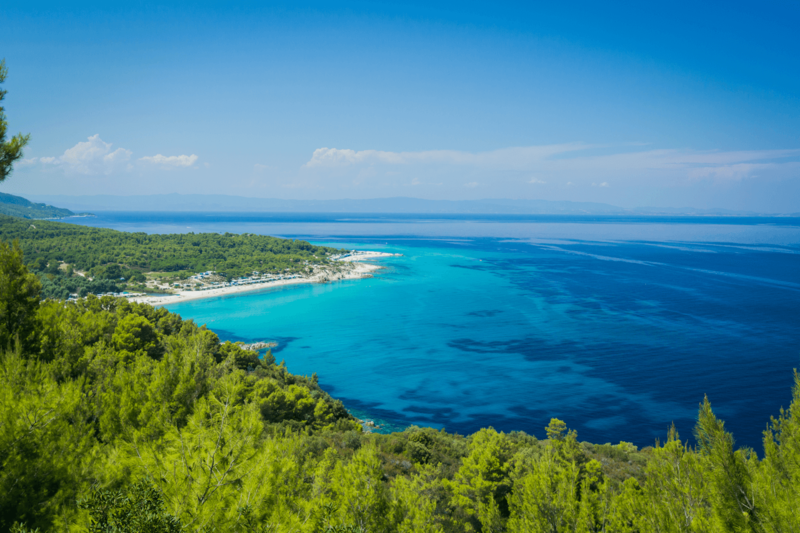 ‘Halkidiki is under 3 hours away from the UK and boasts crystal clear seas, the most incredible food Greece has to offer and archaeological sites that date back 1000’s of years! Each town down the Kassandra peninsular has its own unique charms, from the heritage site of Afitos to the more vibrant Hanioti, you can lose yourself discovering all that Halkidiki has to offer. 1. Take a boat trip around Mont Athos to see all the monasteries. 2. Head to the beach at Sarti for a relaxing day out.